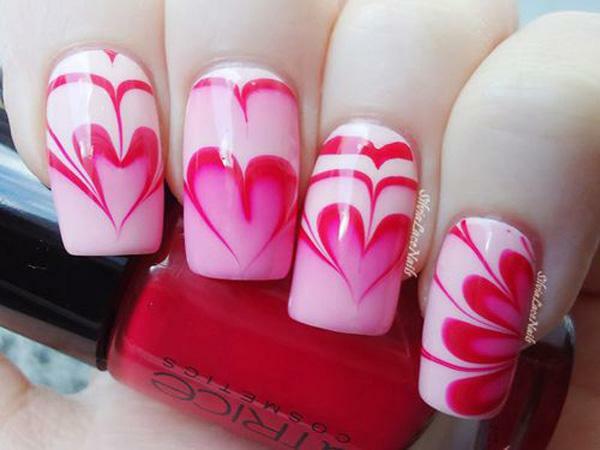 A heart and flower shaped marble nail art design using white and red polish. 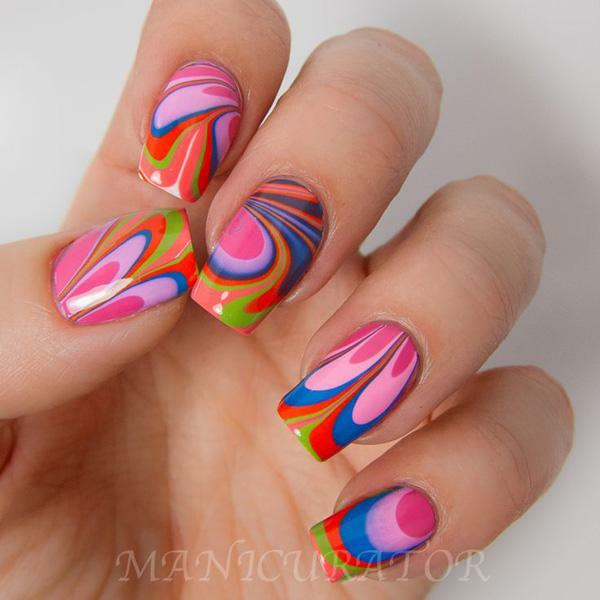 Looking at water marble nail art you seem to think it’s very tricky and complicated to paint. The truth is it’s easier than you think! All you need is the right equipment and you are good to go! 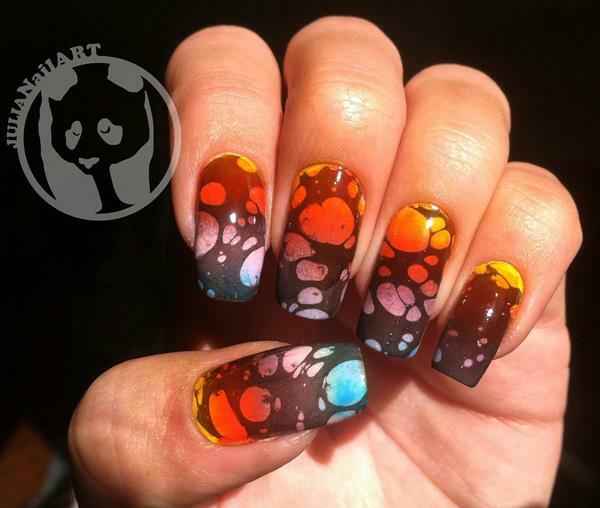 As like other nail art designs, creating your very own marble nail art might be confusing at first. However through practice you will be able to get the pattern of your choice and control the flow of the water marble design. 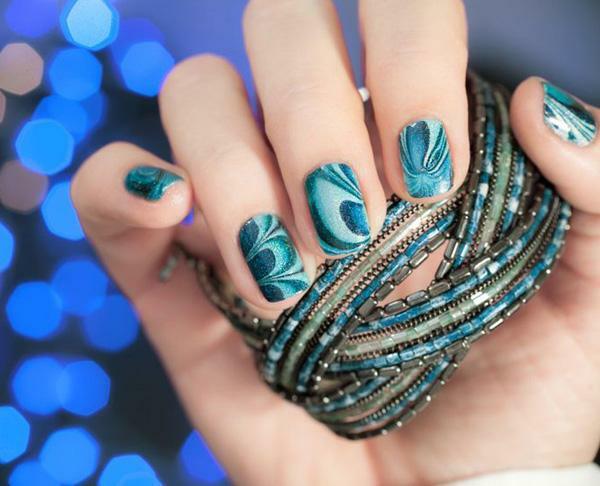 The beauty of water marble nail art design is that the patterns are all so unique and pretty. You can never find one pattern the same as the other. Water is constantly moving so the patterns that you create on the water tend to be varying from each nail. 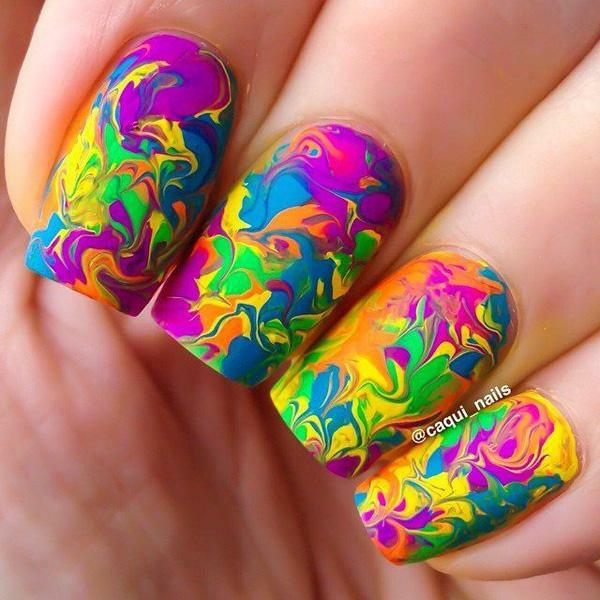 If you are interested in having deviant looking nails that suit your random and changing personality then water marble nail art is perfect for you. 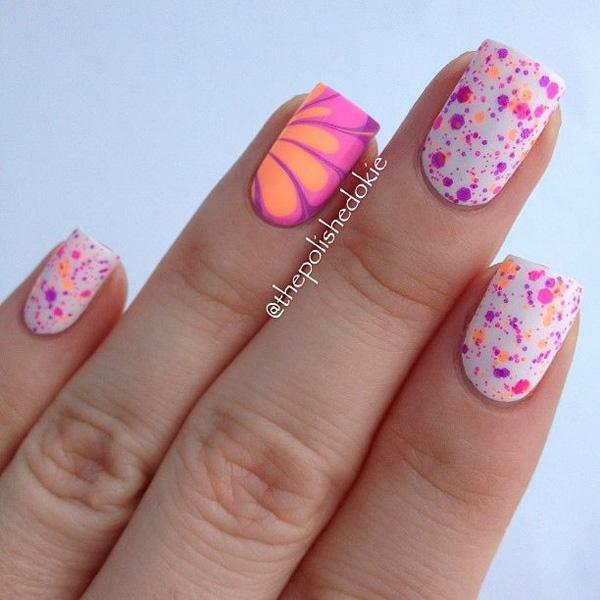 This nail art design is also fun to look at and to create. You can make your very own patterns in a range of various colors that you can easily combine. There is no need for meticulous painting to create that small detail since in the water marble nail art design, the flow of the water will do all the work for you. Start by painting your nails with your base coat. This is to protect the nails from the layers of polishes that are to come on top of it. You can choose just about any color. For a start you can pick a clear color so that you can add on just about any contrasting color on top of it. If you’d like, you can spray on the quick dry spray to fasten the process. Afterwards when the coat is dry, paint on, for starters a white nail polish would be perfect. Paint on with two coats to make sure that the coat doesn’t wear off easily. Place sticky tape on the skin around the nails. This is to prevent any polish to stick to the skin while you are painting on the marble nail design. One other thing you should make sure of is that the tape should not stick to the nails as well. 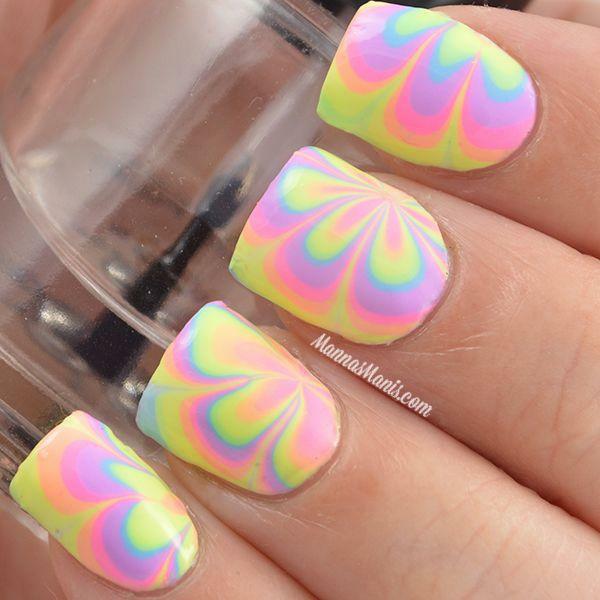 When this happens it would disrupt the pattern of the marble nails because some parts will come out as white. You will have a hard time fixing the pattern when that occurs. Now the fun part begins, it’s time to design the pattern on the bowl of water. Start by putting a nail polish on a brush and hold it at 1 centimeter above the center of the water’s edge. Then lightly tap the brush until the polish drips unto the water. At this point you are free to choose either another color and do the same step. In doing this repetitively, you are able to create a circle pattern on the water. To widen the pattern, take the toothpick and stir the water that surrounds the nail polish in the water. This in turn will make the rings expand. Be careful and don’t let the toothpick touch the nail polish or the pattern will be disrupted. For the flower pattern, put the toothpick on the third ring out of the pattern. Drag it towards the center of the nail polish. Do this on the other sides to create a flower shape on the pattern. Now that your pattern is ready the next step would be putting that pattern unto your nails. Dip your finger in a 45 degree angle. Keep your finger in the water while you use the toothpick and roll out the excess pattern off the water. Take your finger out of the water carefully as not to destroy the design. To keep the design as it is, spray some quick dry spray or you can simply leave it out to dry. After it’s dry peel off the tape around the finger and with the cotton that has been dipped in nail polish remover, remove the excess paint that has stuck on your skin. Be careful on pulling out any parts near the cuticle as it can accidentally affect the pattern. The last part is painting over the design with a clear coat and you are done! 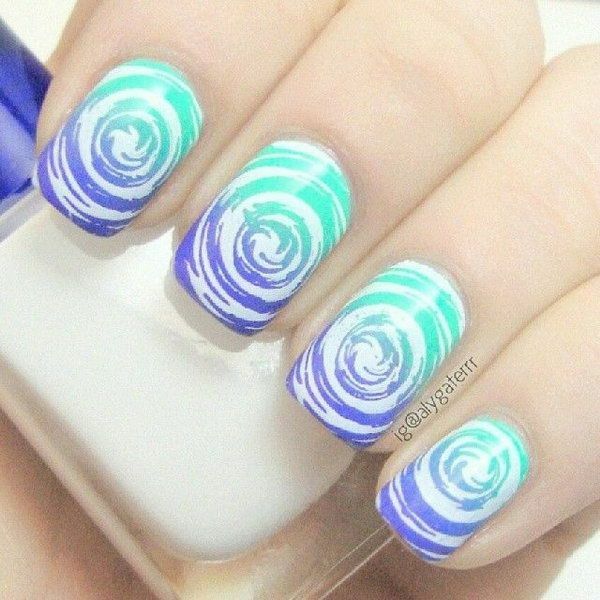 Simply repeat the steps to the other nails and show off your new unique water marble nail art design! 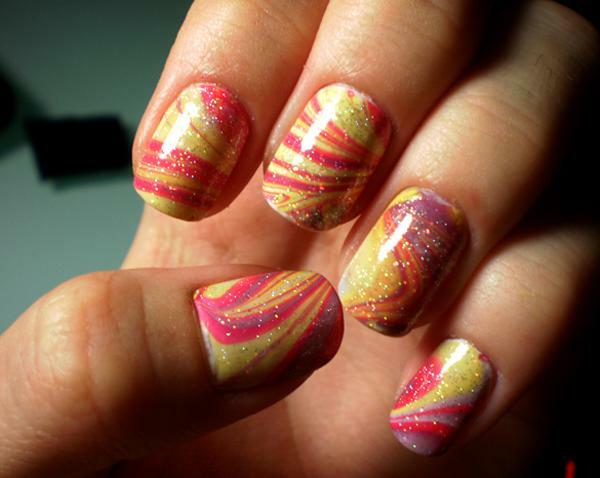 A cute water marble art design inspired nail art in white, pink yellow, orange and violet color combination. 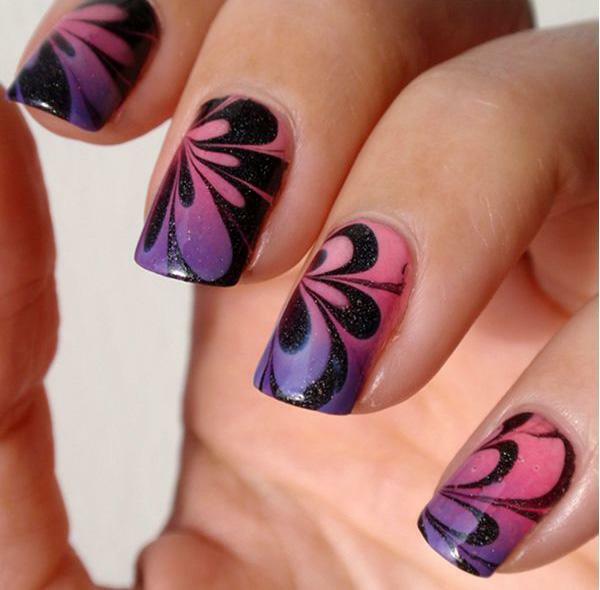 A perfectly flower shaped water marble nail art detail in black, pink and violet colors topped with silver dust sprinkles. 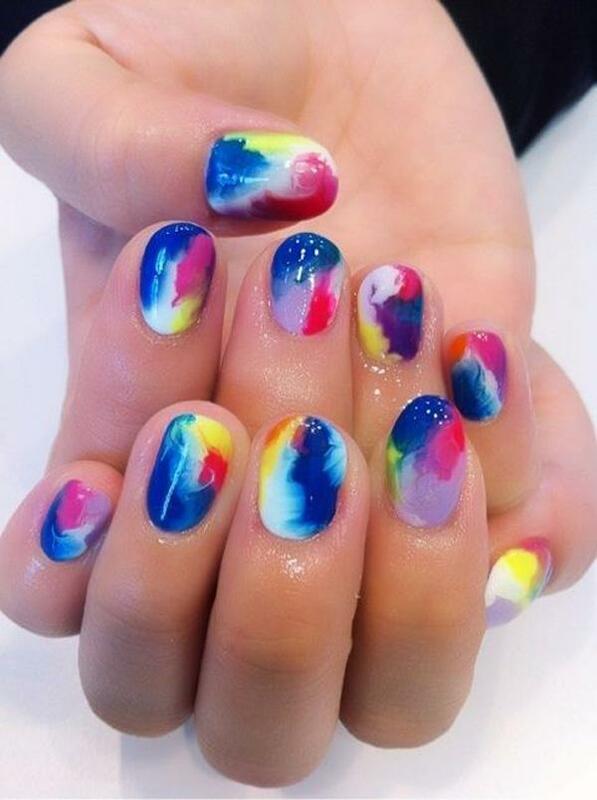 Very colorful and vibrant marble nail art theme in blue, violet, yellow, green and orange colors blended in together to create random shapes. 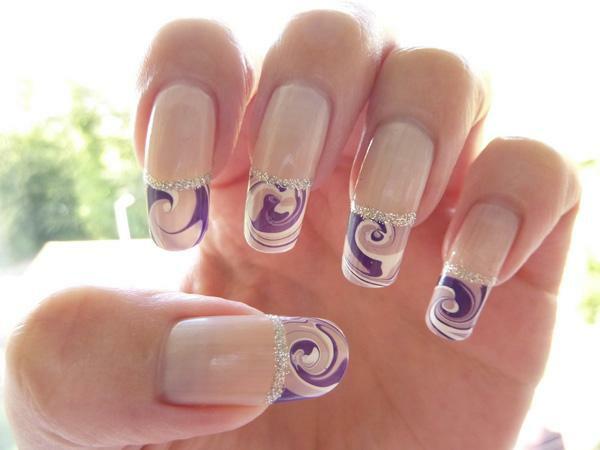 Perfect water marble nail art French tips in matte pearl white color and violet polish lined with silver beads. A flower shaped marble nail art design in violet, red violet and orange nail polish combination. A very cute and striking water marble nil art using white and periwinkle polish atop a baby blue base coat and clear beads. 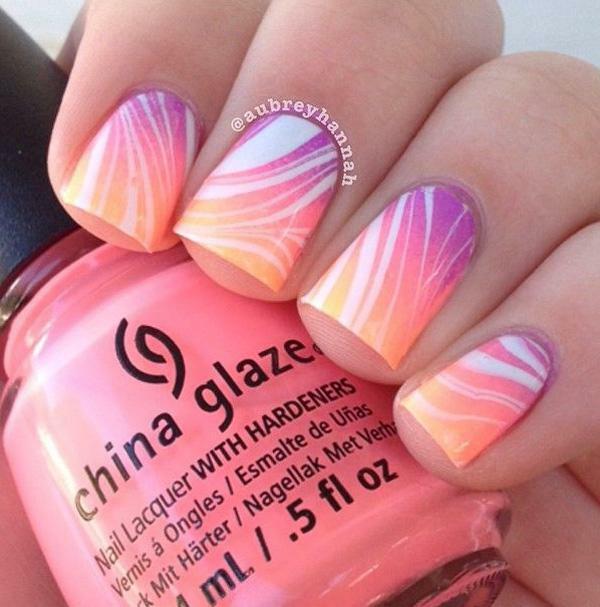 This water marble nail art design is very creative in making white swirling patterns on top a gradient base color. 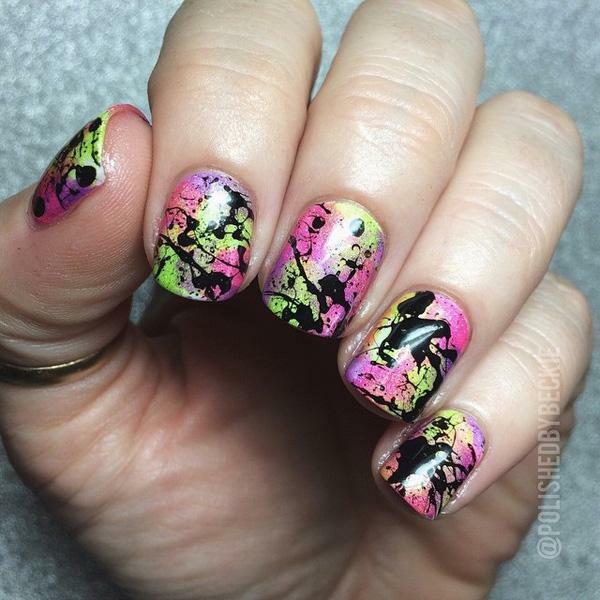 Another swirling marble nail art effect in neon colors against a black base polish. This water marble nail art design can easily remind you of sweet gummy bear colors because of its quirky color combination. 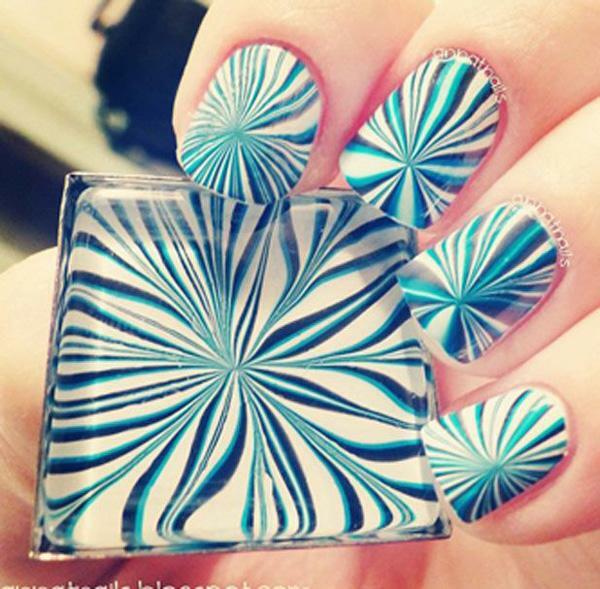 A radical and sassy water marble nail art design in white, blue and green blue polish patterned together to create intersecting lines. 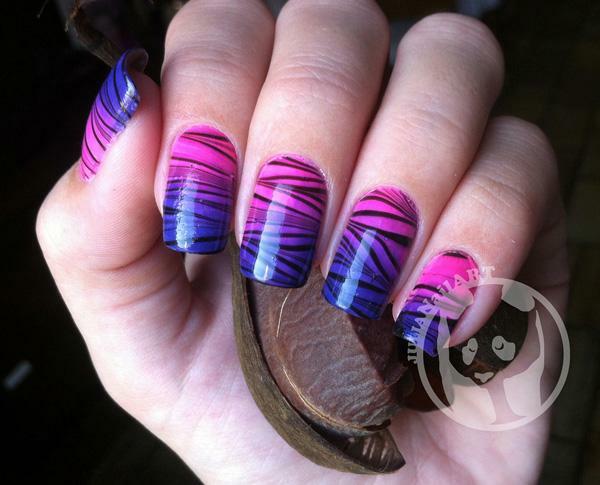 A zigzag patterned water marble nail art design in black polish over a pink and blue gradient base color. 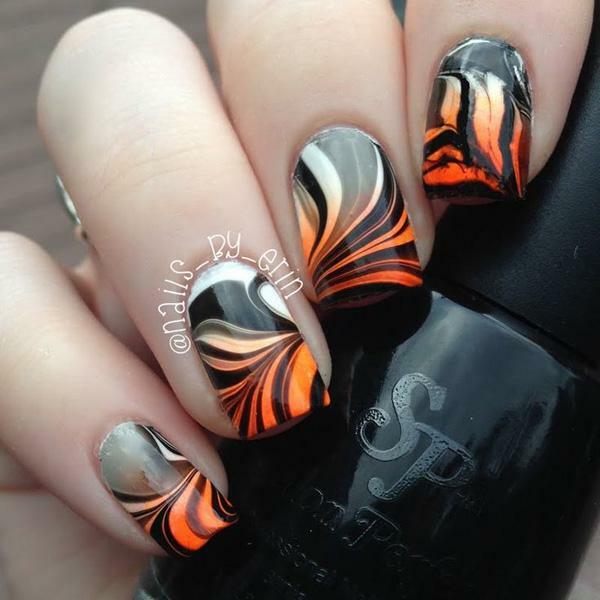 Fiery and a sure stand out, this water marble nail art design plays around with the orange, white and black color combination. 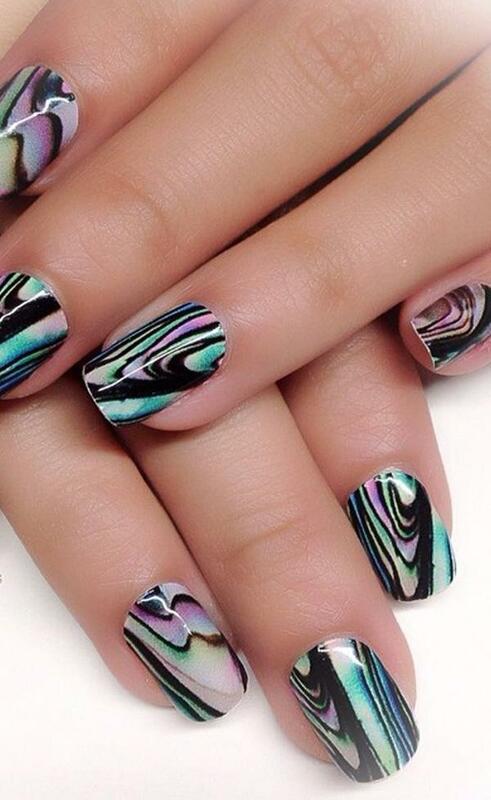 A bubble patterned water marble design using black polish against a gradient background. 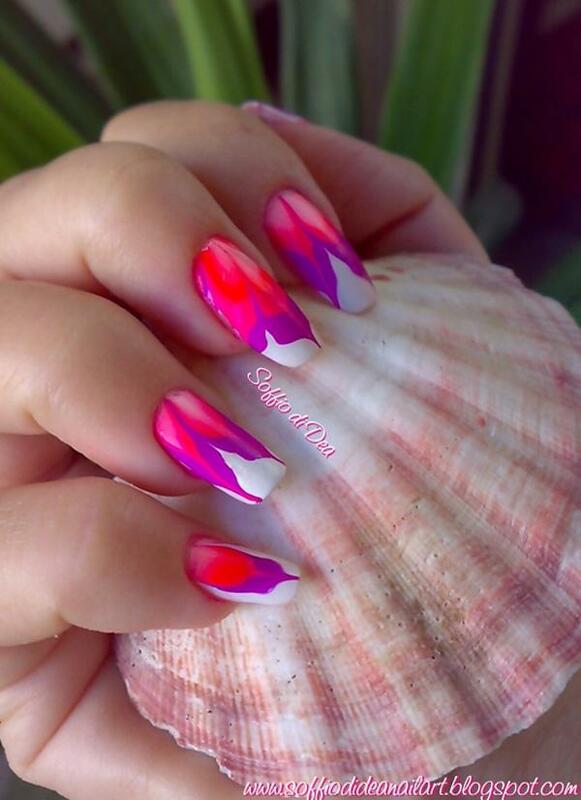 Flower patterned water marble nail art design using white, violet and pink nail polishes. 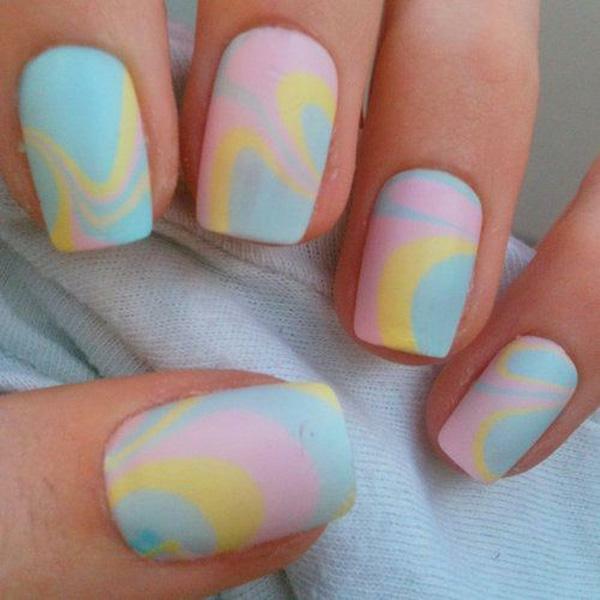 Water marble nail art design in baby pink, yellow and blue colors. Add attitude to your marble nail art design by adding silver sparkles on top of the abstract pattern. A very cute flower patterned water marble nail art design with aquamarine, violet and pink nail polishes. Amazing looking flower patterned water marble nail art design in dark to light forest green shades and silver dust on top. 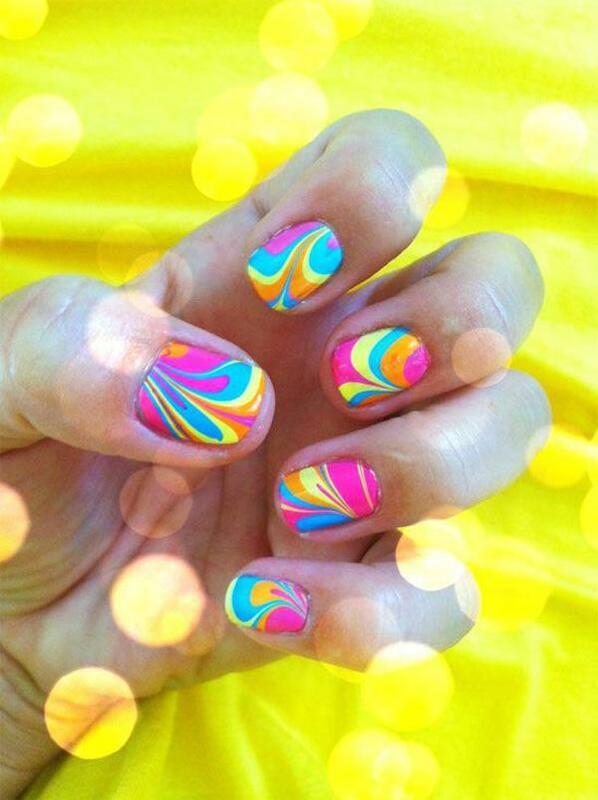 Candy colored water marble nail art design in pink, blue, orange and green polishes. 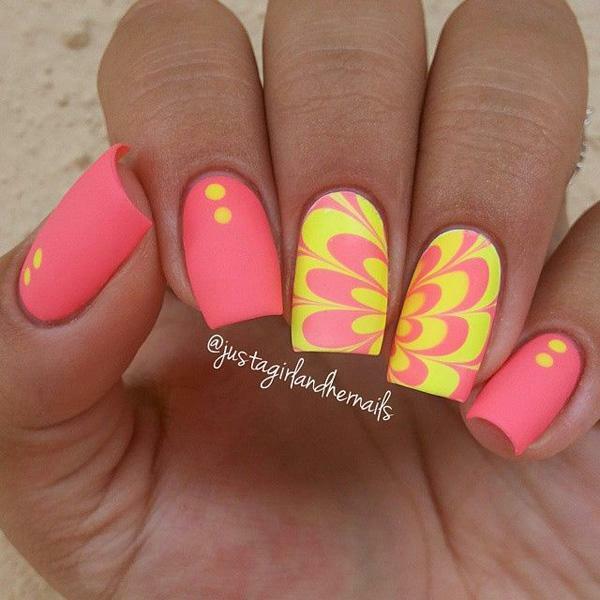 An eye catching combination of matte and water marble nail art design using salmon, and bright yellow nail polishes. 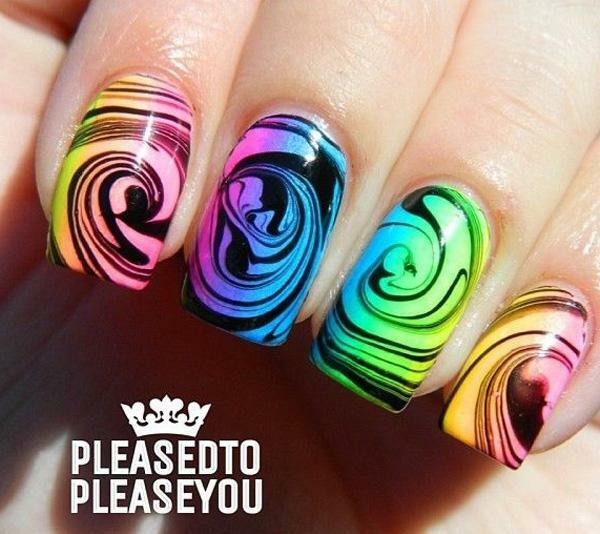 Play along with various colors with this water marble nail art design in pink, yellow, orange and blue combos. 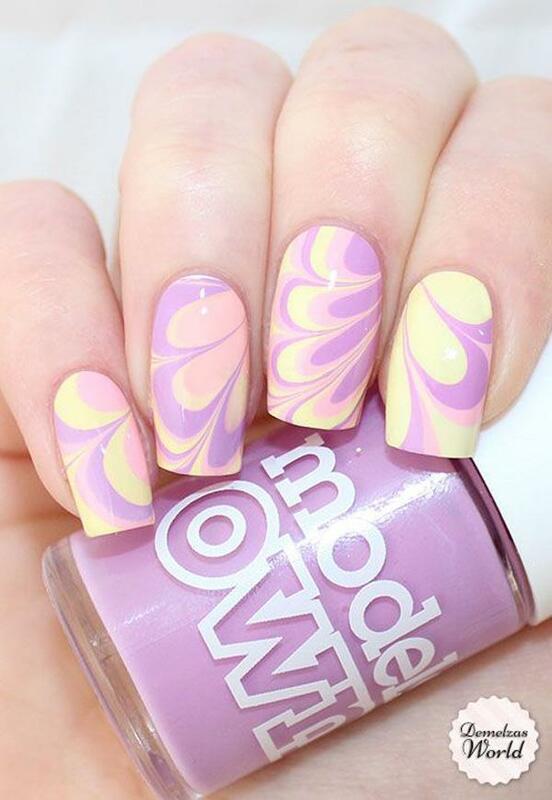 Add dram to your gradient nail art theme by adding strips of white water marble nail art polish. 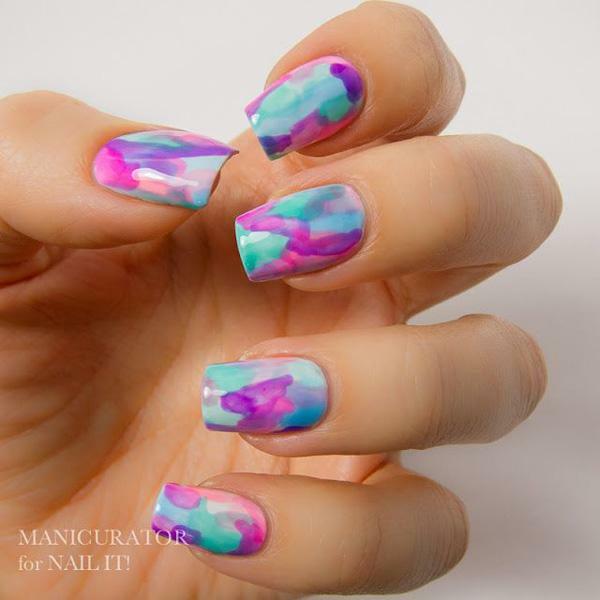 Paint your nails in abstract colors using water marble nail art design in blue, sky blue and violet polish. 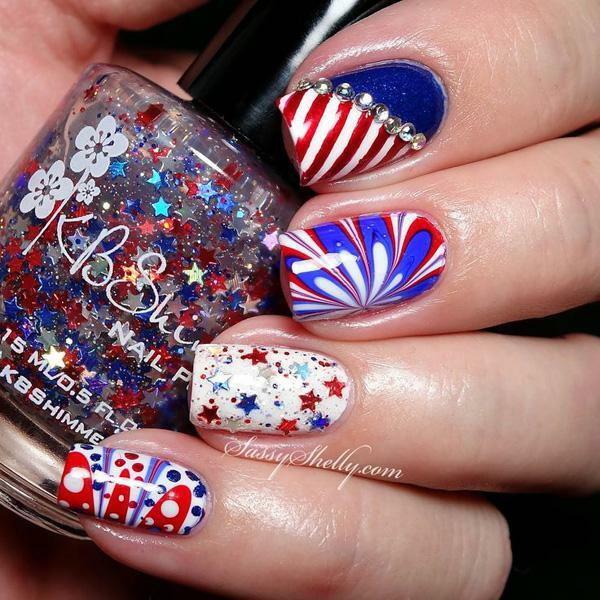 Add sparkle to your Fourth of July theme with a white, red and blue flower patterned water marble nail art design. 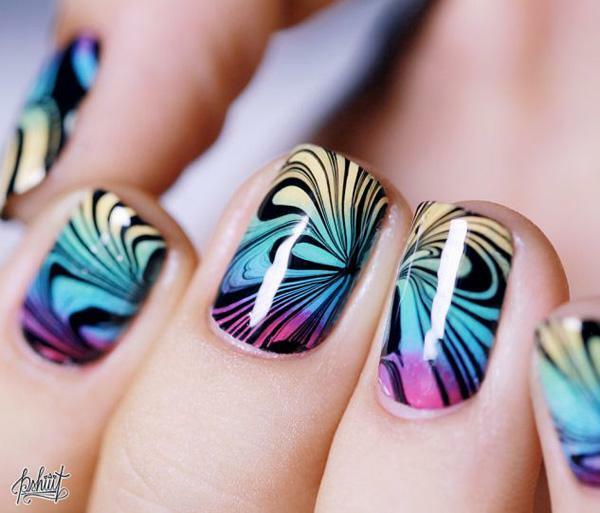 Make your gradient nails perfect by adding water marble nail art designs using black polish and creating flower patterns. 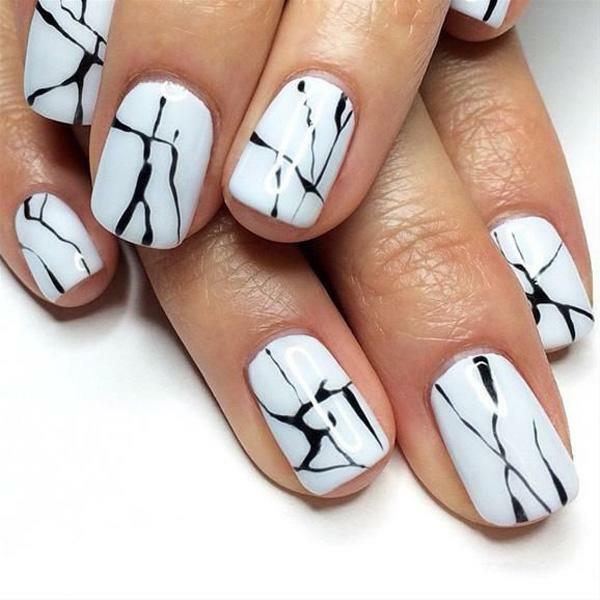 Nothing like making your nails into your personal works of art with water marble nail art design using white as your base color and black for the dripping details. Loving the splashed paint effect on the nails? 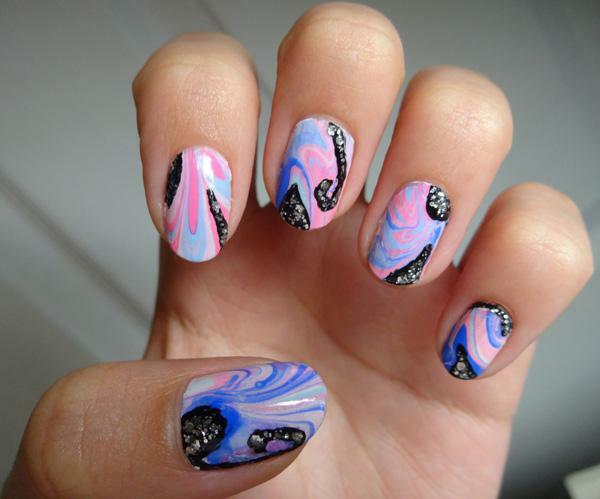 You can easily do this with help from water marble nail art effects. 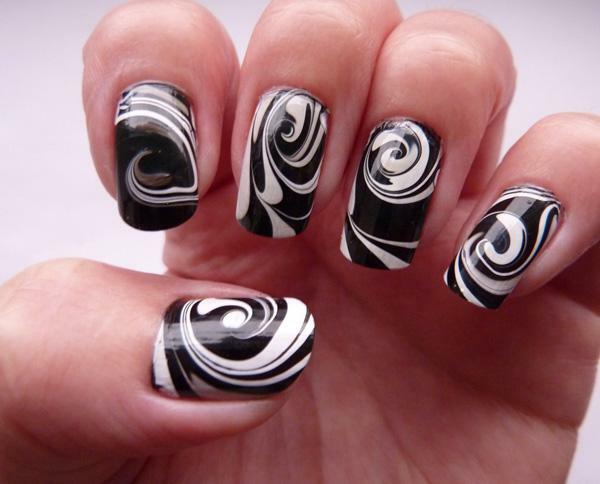 Create white swirling patterns for your water marble nail art design and paint them on your nails in contrast to a black base color and enjoy the results. Give life to your nails with a combination of yellow, violet and red polishes created with water marble nail art design plus silver dust on top. 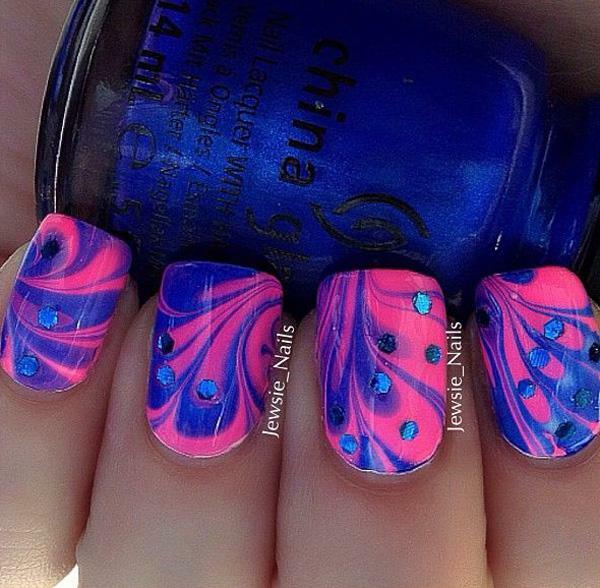 Simply make flower patterns using blue and pink polishes in water marble nail art design and add blue beads on top for effect.